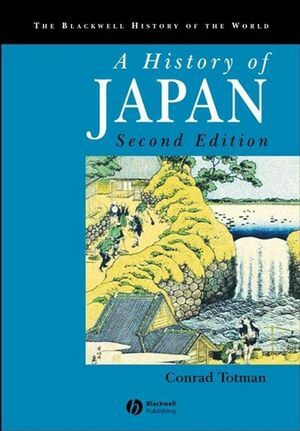 This authoritative and accessible book charts the history of Japan from c.8000 bc to the 1990s. Conrad Totman is Professor Emeritus at Yale University. He has also taught Japanese history at the University of California, Santa Barbara and at Northwestern University. He is the author of ten previous books, including Japan before Perry: A Short History (1981), Early Modern Japan (1993), and Pre-industrial Korea and Japan in Environmental Perspective (2004). 1. Geology, Climate, and Biota. 2. From Origins to Agriculture. Part II: The Age of Dispersed Agriculturalists (400 BCE - 1250 CE):. 3. Political Consolidation to 671 CE. 4. Establishing the Ritsuryô Order (672-750). 5. Ritsuryô Adaptation and Decay (750-1250). 6. Classical Higher Culture (750-1250). Part III: The Age of Intensive Agriculture (1250-1890):. 7. The Centuries of Disorder (1250-1890). 8. Medieval Higher Culture (1250-1550). 9. Establishing the Bakuhan Order (1550-1700). 10. The Age of Growth (1590-1700). 11. Stasis and Decay (1700-1850). 12. Crisis and Redirection (1800-1890). Part IV: The Age of Industrialism: Early Decades (1890-Present):. 13. Early Imperial Triumph (1890-1914). 14. Early Imperial Society and Culture. 15. Later Imperial Politics and Economy (1914-1945). 16. Later Imperial Society and Culture (1914-1945). 17. Drift to Disaster (1914-1945). 18. Entrepreneurial Japan: Politics and Economy (1945-1990). 19. Society and Environment (1945-1990). 20. The Culture of Entrepreneurial Japan (1945-1990). Epilogue: Japan Today and Tomorrow. B. Chinese Words: Wade-Giles & Pinyin Orthographies. C. Glossary of Japanese Terms. Provides a complete history of the region from 8000 BC to the present day. Covers all varieties of history from cultural and social to economic and environmental.